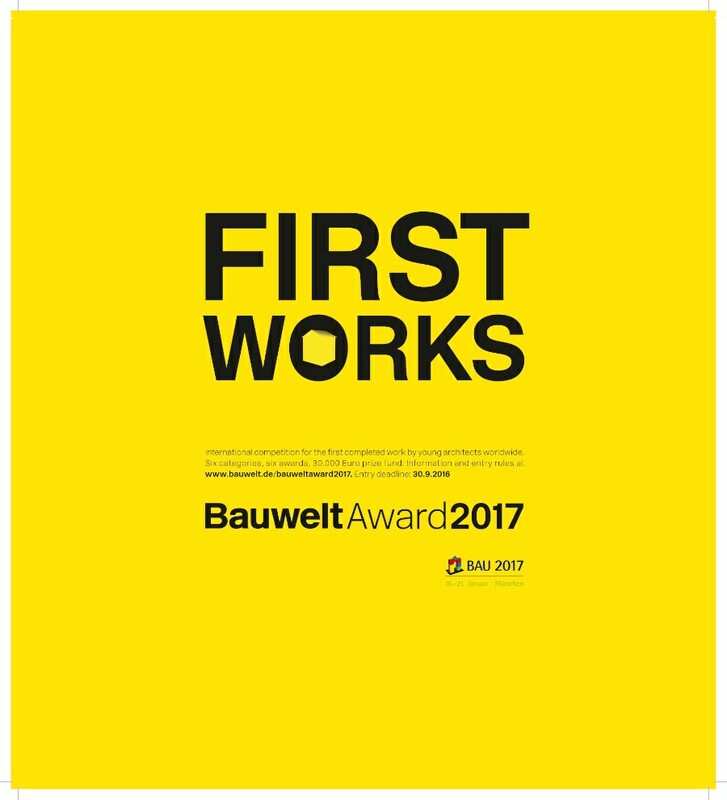 Call for Projects: Bauwelt Award 2017 [bando pdf 70KB] «The Bauwelt Award (consisting of 6 awards of 5000 Euros each), awarded this year for the 10th time in cooperation with Messe München, applies to all categories of “First Work” – from the interior design of shops and stores to prototypal constructions, from public housing projects to the restructuring of a public space and to temporary interventions – and a not-yet-realized project with socially relevant approach for the advancement award (award optional). Qualified for submission is every first work the submitter has realised on his or her own responsibility and which has been completed after September 30th, 2013. The closing date of the submission is September 30th, 2016. Eligible to participate are architects and landscape architects from all over the world, individuals as well as working teams. 1. On the first sheet the project should be shown with a single photo. 2. On the second sheet the written description of the project should be placed including generell information of architect and project. The explanatory report should not exceed 200 words and must be given in German or English. 3. and 4. On the third and fourth sheet the participants take care to ensure that their work shall be represented by drawings and photographs completely and clearly in its totality and in the details. It is expected that the layout plans and sections necessary for understanding the project are delivered».